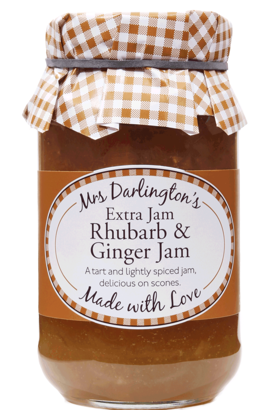 A decidedly English pairing of flavour's bring you this unique jam: the slightly tart taste of rhubarb and the lightly spiced flavour of ginger compliment each other perfectly. Livens up your morning toast and adds a little pep to any teatime tray. Made with Love. Suitable for Vegetarians & Vegans and suitable for a Gluten Free diet. Refrigerate once opened. Ingredients:Sugar, rhubarb (39%), stem ginger (8%), gelling agent: pectin, lemon juice.